The Live | face to face seminar can be best described as a marathon. 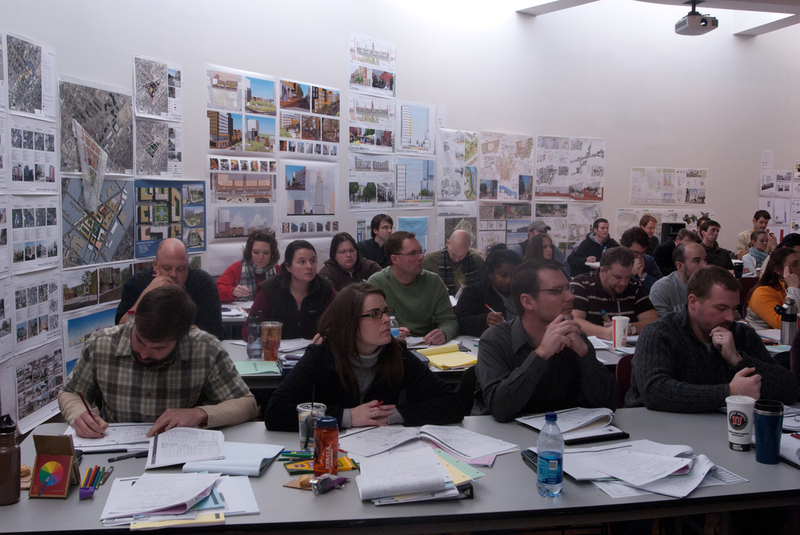 It is over 30 hours of intense review of the Structural topics included on the Architect Registration Examination, (A.R.E.). While that may sound grueling, many participants actually enjoy the experience due to the humor and inventive teaching techniques Professor Thaddeus has developed. This is definitely not an excruciatingly long power point presentation. It is a multi-media “ARE boot camp”, punctuated by audience interaction. Professor Thaddeus welcomes questions and comments from participants at anytime during the presentation. His immediate attention to any problems enhances all of the participants’ understanding. Professor Thaddeus begins each seminar by taking a “mug shot” photo of each participant. He prides himself on the ability to know everyone’s name by the Saturday morning of each seminar. Over the years he has become adept at keeping the group focused through the utilization of a variety of presentation tools. Prof. Thaddeus draws on a tablet computer as he works through problems explaining the necessary steps to determine the correct answer. He also uses the tablet to draw on projected photos, visually connecting structural diagrams with their real life counter-parts. His computer-animated illustrations provide a clear understanding of the behavior of a variety of structural systems under different loading scenarios. A series of laser cut “TOYS” provide yet another alternative to display the action of forces on different structural members. In short, Prof. Thaddeus has numerous methods through which to assure that seminar participants understand everything they need to know to pass the A.R.E. The enrollment in these seminars has ranged from 20 to 154 students depending on the venue, sponsor, and location. Each seminar develops a unique personality as interns of all ages and backgrounds become actively engaged with the group. This interaction becomes an integral part of this educational experience. There are adequate breaks during the seminar, however, to get the most out of the seminar, it is strongly suggested that participants arrive well rested, alert, and ready for a concentrated session of re-learning. Remember that this is an ARE-specific review of three semesters of structures in only three days. Seminar fees are set by the sponsoring organization and vary due to the expenses incurred. Those expenses can differ greatly depending on the location. Coffee and snacks are served at most venues and a few sponsors even provide lunch. Check for the details of upcoming seminars on the calendar. A set of “handouts” is included in the seminar fee. Upon registration participants will receive a detailed seminar schedule, and a recommended supply list. Additional information on how to prepare for a seminar is located at DT | on are.